Here's a fairly new duo, performing mainly traditional songs and ballads with inventive close harmony arrangements or instrumental accompaniment. 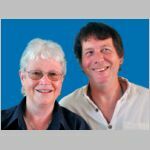 However, Sue has much experience as a harmony singer with various groups; while Paul has long played guitar and Appalachian dulcimer in several bands. They now bring these skills together in a delightful mix of material, presented with obvious enjoyment. The duo were once described by a reviewer as “an unmarriage made in heaven”......!